The much-anticipated Backsberg Dis-Chem Rotary MTB will be heading your way on Sunday, 19 August 2018. 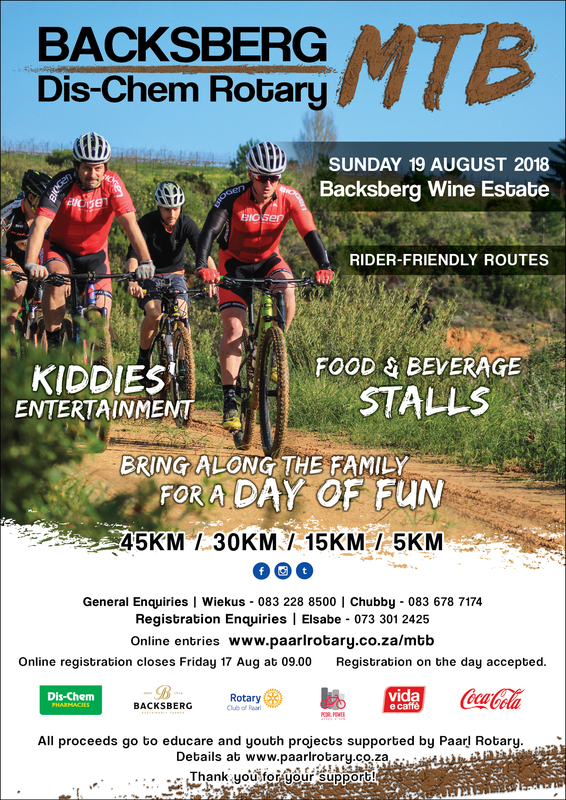 Once again hosted at the Backsberg estate, this annual race aims to provide a scenic route to enthusiastic cyclists in one of the most picturesque parts of South Africa. It also happens to feature a wine stop 5 km before the finish which is certainly an added bonus. Organised and managed by members of the Paarl Rotary Club under the auspices of the Pedal Power Association (PPA), the proceeds from this event go towards sustaining Paarl Rotary’s many charitable projects and truly epitomises the notion of riding for a reason. It is a family-friendly event with up to two children riding free in the 5 km race if accompanied by a paying adult. There will be food stalls and a kids’ zone at the finish. The route includes single track on private land which has been opened up exclusively for the event. The 45 km, 30 km and 15 km routes contain some of the best scenery in the area, with great views of the Cape Winelands. The roads are 90% jeep track with some single track and open roads in between. There are some solid climbs, from meandering S-bend climbs to vicious little bumps with fast-forward downhills to recover. The 45 km, in particular, includes major climbs: a long 201m steep climb, and a second 110m short climb and is only for fit and experienced riders. It requires more technical riding skills, including a fast descent near the end, than the average PPA fun ride and should be seen as a challenge for the fit rider, definitely not for the inexperienced. The 30 km is geared for fit, experienced riders and includes one long 130m climb. The 15k is just right for novices and beginners. The 45 km route starts at 07:30, the 30 km medium route starts at 08:00, the 15 km short route starts at 08:30, and the 5 km children’s race starts at 09:00. The cut-off time and lucky draw will be at 11:30. On-line entries (varying between R50 and R210) are accepted until 09:00 on Friday, 17 August and are limited to 1000 entrants. Late entries will be accepted on the day of the race (R210, R190, R170 and R80) if the limit of 1000 has not been reached. 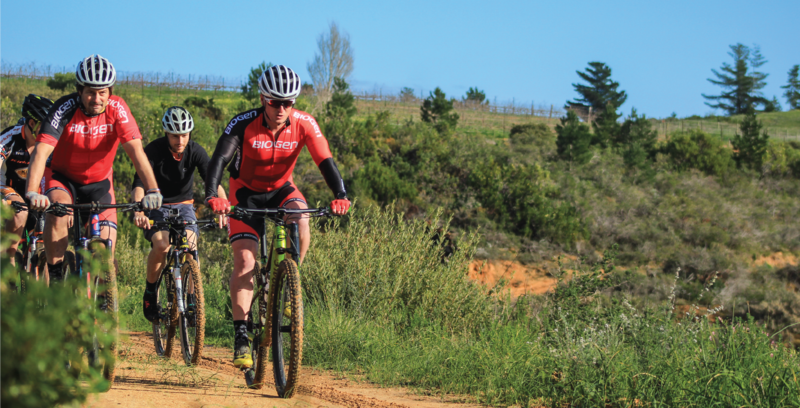 Social Media Competition: In anticipation of this noteworthy mountain bike race, the event organisers will be hosting a joint online competition. To enter, simply visit www.paarlrotary.co.za/mtb – complete your online entry and stand to win an MTB hamper valued at R8,000.00 (including an overnight stay for two, a meal, and Backsberg and Dis-Chem products). Head on over to the Backsberg Facebook Page, viewable here, like the page, share the competition post on the page, and comment on the post with your valid entrant identification number. The prize winner will be announced on the day of the race. To view the full event flyer, click here.